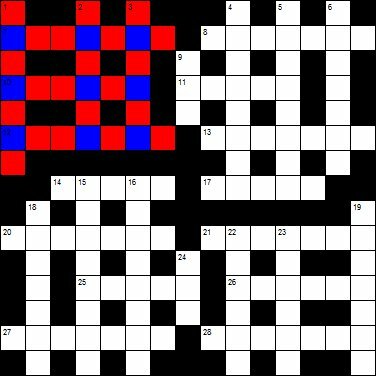 Designing a crossword grid is by no means easy, and this piece discusses the basics of good grid construction. Just before writing this I had to reject two crosswords which I had been sent for publication. In both cases the clues were generally very good, but the grids the setters had used were not acceptable. It is always a shame when this happens, and to the uninitiated it may seem like sending back a perfectly decent meal because you don�t like the colour of the plate. Isn�t the grid just somewhere to put the answers to the clues? To some extent that�s true, and I�ll confess that I think people on crossword forums who get worked up about very minor aspects of grid construction would benefit from getting out a bit more. However there are certain limits to what is acceptable, and a poorly designed grid can make a puzzle unnecessarily difficult, if not impossible, to solve. Almost all of the problems one encounters with grids concern what is called checking. A checked letter is one which appears at the intersection of an across and a down answer. Since this letter is shared by two answers, you have a way of checking that you�ve entered the correct letter in the grid. An unchecked letter is one that does not intersect with another answer. In the NW corner of the example grid on the left, the checked letters are in blue and the unchecked letters in red. The term �unchecked letter� is often abbreviated to �unch�. It�s an ugly word (it sounds like a pit bull taking a large bite out of the postman�s leg) and I�m all for keeping jargon to a minimum in these days of �blue sky thinking� and other such nonsense, but the abbreviation is rather convenient so I shall be using it here. It should be obvious that the more unches there are in an answer, the less help you get from crossing answers, which rather defeats the point of a crossword (the clue�s in the name). The generally accepted standard is that the number of unches should be no more than half the total word length. I have illustrated this in the table below. For words with an odd number of letters, the ideal is that checked letters should outnumber the unches by one. The numbers in brackets indicate the number of unches you will find quite often in practice in grids from respectable sources. As for two unches in a 3-letter word, that�s a no-no. Look at the examples of this in the grid above (9 and 24 down). Apart from giving minimal help to the solver, it looks very amateurish, doesn�t it? It is also important to avoid having too many consecutive unches in an answer. A �double unch� as in 26 across in the example grid isn�t too bad, because half the letters of the word are checked. In 21 and 28 across it�s really pushing it � four unches in a seven-letter word isn�t great anyway, and when two of them occur consecutively the resulting letter pattern is very unhelpful. Double unches should not appear at the start of a word � denying the solver the opportunity to check the first two letters is unfair, and looks sloppy too � and preferably not at the end. Triple unches, such as in 6 and 18 down, are to be avoided at all costs. 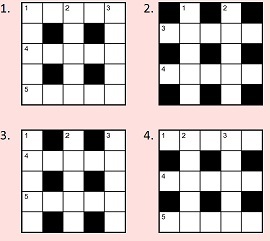 In the case of barred crossword grids, such as those used by Azed, the requirements are rather stricter. The maximum number of unches allowed for words up to 11 letters in length can be worked out by halving the total number of letters and subtracting 1 (or 1.5 in the case of an odd number of letters). Thus the maximum number of unches permissible for a 9‑letter word is 3. Four unches is the maximum for a 12-letter word, and 5 for a 13-letter word. Barred grids usually don�t accommodate words longer than that. Double unches are not allowed at all, unless there is a strong thematic justification for including them. One of the useful features of the Sympathy program is that it tells you if the grid you have designed has too many unches (consecutive or otherwise), and also if there are too few. You do come across grids where there is so much checking that some of the short words fill themselves in, and while this is not particularly desirable, it is obviously better to be too helpful rather than too unhelpful (something the staff of certain budget airlines have yet to learn). You may well have noticed that there is another fault with my example grid. The four corners are separated from each other, so that essentially the grid contains four discrete mini-grids. This usually happens by accident, maybe as a result of blanking out white squares in order to fit in certain preferred words. It�s always a good idea to check that there is reasonable overlap between the four corners of any grid you design. As you can see, the grid here has large chunks of black running through it, and apart from being aesthetically unpleasing and wasting space, too many black squares joined together is quite a reliable sign that there may be something wrong with the grid. There are four basic grid patterns, as illustrated on the left. If you use Sympathy or Crossword Compiler to create your grids, all of these will be offered to you when you choose to design a grid from scratch. Pattern 1 is the one used for Times grids, and it has the advantage that you are unlikely to run into many problems with checking. It is also the most solver-friendly in that you have far more initial letters of answers checked, and getting the first letter towards an answer is very helpful. Pattern 2 is more apt to lead to answers with too many unches, but can be useful if you want to include a Nina in your puzzle. I�ve also found from experience that Pattern 2 is more amenable to accommodating a large number of theme words. If there is a list of words that must appear in your grid, it can be awkward to fill in the rest of the grid without resorting to obscurities. It is easier to fit words together if there are fewer intersection points, as is the case with Pattern 2. Patterns 3 and 4 come somewhere in between in terms of advantages and disadvantages. It has become standard practice that a crossword grid will have some degree of rotational or mirror symmetry. There�s no reason why this should be apart from that it looks neater, but the convention has been established so firmly that if you submit a crossword with an unsymmetrical grid to any crossword editor, it�s likely to be rejected right away. The only exception is in thematic puzzles like the Listener, where implementation of the theme may require an unsymmetrical grid. Be advised that even in this case there must be a very strong thematic justification for a lack of symmetry. If all of this seems rather daunting, there is good news. You don�t actually need to design a grid at all. Both Sympathy and Crossword Compiler come with a series of stock grids, and if you don�t have either of these programs, you can use a blank grid from one of the newspapers. In the latter case you should populate the grid with your own words rather than use the original gridfill, in case there are issues of copyright. If you get on to the team of setters for a national newspaper, you will find that all of them (except the Independent) have their own sets of stock grids, so the matter of designing your own doesn�t arise. I always advise new setters to use ready-made grids if possible, so that they can concentrate on their clueing technique without having to worry if the grid is acceptable or not. If you want to �seed� your grid with a few words for which you have already written clues, there�s absolutely no shame in using a stock grid with suitable answer lengths to accommodate these words. You may need to try your seed words in different positions in the grid, in order to avoid including obscurities or clue-unfriendly words among the remainder of the answers, and if necessary you can always modify a stock grid to suit your requirements. If you do make modifications, make sure that you�re not creating too many unches or, worse still, four unconnected mini-grids as discussed above. I think I have covered all the things that can go wrong with grid construction, but I haven�t included a detailed step-by-step guide to show the process of designing a grid from scratch. This is because I almost always use off-the-peg grids, which I then fill using my compiling software. For my FT puzzles I use the paper�s stock grids, as required, and when I produce puzzles for the Independent or this site I use one of the many ready-made grids that come with the Sympathy program. I make changes to the stock grids if I can�t otherwise fit in the words required for a theme, but it is very seldom that I construct the entire grid myself. Therefore I am probably not the best person to write such a guide, but fortunately there are a couple of superb articles which cover all aspects of designing a grid from scratch in detail. The first is on the excellent Crossword Unclued site, and the second is written by one of today�s leading setters, Anax. As I said at the start, it�s always a pity when a decently clued puzzle doesn�t make the grade because of a substandard grid. I have written this piece in the hope that it will help to make the possibility of that happening less likely.